IMAGE: Engraving of Kent House which appeared in a two-volume work called 'Greater London', produced by Edward Walford, published about 1882. At that time the building was still a farmhouse. Standing on the border, between Beckenham and Penge, it derived its name from being the first building in the County of Kent on the local road from London. It was recorded in the 12th century as a Norman-owned estate, half of which was leased to the Hospital of St Katharine (near the Tower of London) by 1240. The house was owned by a series of City merchants over the following centuries. One was John Styles, who dealt in wool in London and Calais in the 15th century. Another merchant, Anthony Rawlins, died at Kent House in 1694 and bequeathed money to found almshouses. They surviive today, in remodelled form, at the corner of St George's churchyard, in Beckenham. The Russian banker and Lloyd's insurer John Julius Angerstein acquired Kent House in 1784. The building became a farm house from about 1806 and the 178-acre farm had grazing rights on Penge Common. Kent House became a nursing home and then a private hotel before being pulled down in 1957. Its site is now covered by Beckett Walk. 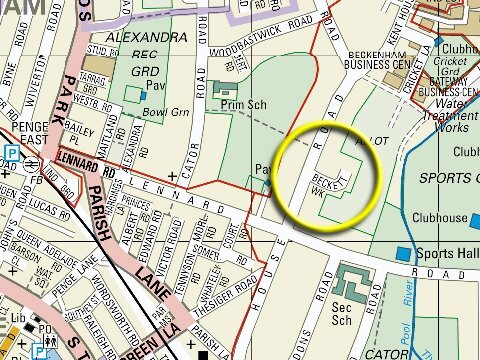 Its original site is shown by a yellow circle on the street map below.